Sara’s Choice Organic Chlorella has been subject to the same stringent sourcing process you have come to expect – only after every sample of this algae from around the world has been researched and tried by Sara herself; does it get to bear her name. Studies have shown Chlorella to have antioxidant action and can help to manage hunger, diabetes, anxiety and depression. Check out these studies on our Research page. 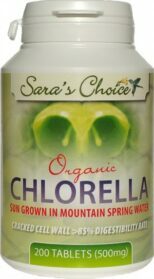 Sara’s Choice chlorella uses a patented pressure process to create a broken cell wall which renders it 85% digestible. Because of the naturally fibrous cell wall of chlorella; without this, it’s nutrients would remain indigestible to humans.